Saute, fry, broil, and bake with one pan. 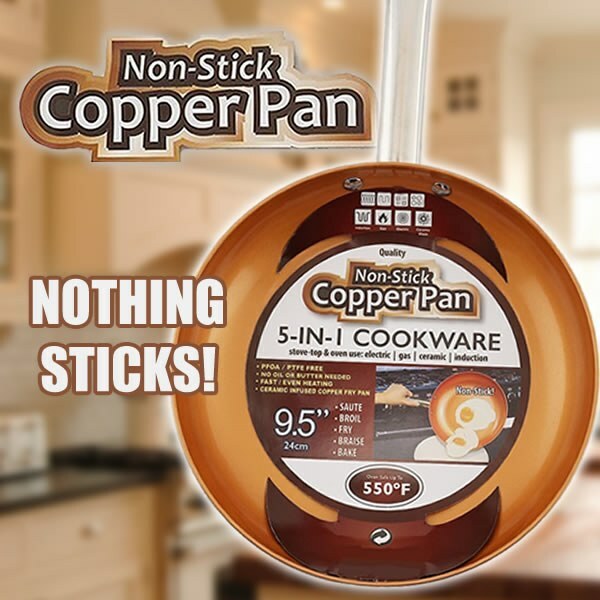 The Non-stick Copper Pan is lined with a ceramic coating to make sure you use little-to-no oils, butter, or fats for healthy stick-free cooking. The Copper-infused cooking surface features fast and even heating. Better non-stick properties than Teflon, it&apos;s even PFOA/PTFE-Free. A sturdy, double-riveted handle provides a nice ergonomic grip on the pan. Heat-resistant up to 550 degrees, take a seared steak on the stovetop directly into the oven to finish it off. High temperature cooking can be done on virtually anywhere: electric, gas, ceramic glass, and even induction cooktops. Caring for your pan: while dishwasher safe, hand washing will prolong the life of the pan. Avoid sharp metal knives or utensils: use wooden, silicone, plastic or nylon instead. Avoid cooking spray which could lead to residue buildup.